Home » show and tell » A Finish! I know the Lotto drawing for the Steps hasn’t even happened yet, but I made some for myself and I have a finish to share. The first pictures was taken in the house and shows it complete, but the outside picture shows the colors better. 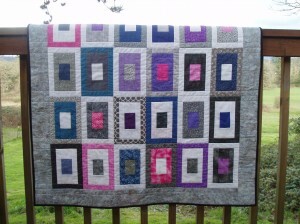 Like Sophie, I seldom use black as a binding but the graphic feel and the grays in this quilt made me feel that the black would work. Pssst! I have to admit I did extra blocks of the “Tall Fly”, another drawing I did not win, and I have that top basted and ready to quilt. Hopefully I can “show and tell” that one next week. What a wonderful quilt! Would you consider this a modern quilt? Sophie inspires us so much, don’t you think? That turned out so cute!!!! 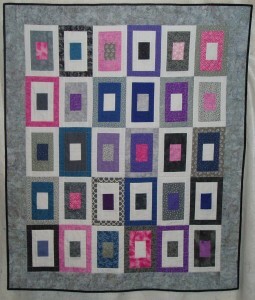 It is great to see a finished quilt so fast!!!! It is making me more motivated to finish one of mine!!! Wow, that is fast. Love the colors you used. The quilt looks fantastic. That is fabulous! You are such an overachiever. And I’m so jealous. LOL I love the black binding. I can hardly wait to see the tall fly blocks.